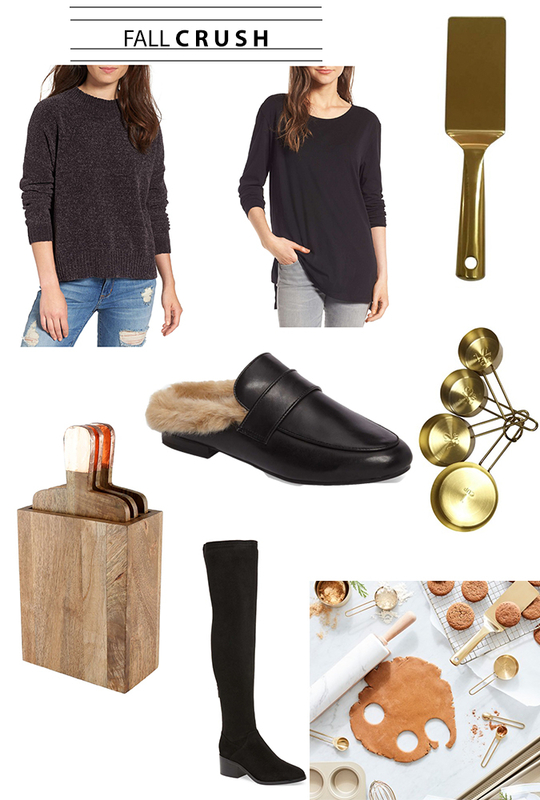 Top Fall Items I’m Crushing On! I LOVE this time of year! It feels fresh and new as the weather changes from hot to cold into fall and I love the colors and smells. I have been searching for new, fun items for my wardrobe and for my house. There are some GOODIES!! Can’t wait to share with you below! Mango Wood Serving Boards & Holder – how good would this look on your kitchen counter?!! I use a cutting board all of the time, so I just ordered this set to display these pretties. They are 45% off!! Black Thigh High Boots – I just ordered these! I’ve been looking for some cute thigh high boots perfect for fall where the heel isn’t too tall and the boot shaft isn’t too large. I’m so excited to get them! They are 20% off right now! Long Sleeve Side Slit Tee – This $19 tee is AMAZING. I own it in 2 colors and I ordered it in a 3rd! It’s the perfect cozy layering piece for fall and winter. I even wore it to bed the other night! That’s saying something. Faux Fur Mule – I’ve been eyeing these for a few weeks! They look so comfy and I love that the black will match anything. The original Gucci mules are like $900. No thanks!! These are $89.95. Much more doable. Funnel Neck Sweater – I saw this sweater at Nordstrom a few weeks ago and loved it but they didn’t have my size. I just ordered it in “grey shale.” It was SOOO soft. Like, so so soft. I can’t wait to wear it! Marble rolling pin – I just bought a cute little holder for my kitchen utensils and I’m going to add this to it! It will look so pretty displayed on my counter. Gold turner spatula – LOVE this pretty little number! I’ll put it in my utensil holder too. Gold whisk – And yet another pretty little utensil that I use all the time. Why not buy things that are pretty? Enough with the ugly useful items! There are pretty useful items that are the same price. Done! Gold measuring cup set – I have these and I love them! I use the almost every day and they make me smile because they are pretty. I loved the Halloween costumes your family wore last night! So stinkin’ cute! I wanted to see what size you wear on the long sleeve side slit tee? The website says it runs large so I just wanted to check. Hi Jennifer; thank you so much! It was such a fun night! I wear an XS so yes, they do run big. I feel that I’m normally a small but the XS is perfect in the side slit tee.